"FRESH TOKYO CAR MEET 2017" Legendaly tokyo underground carmeet This is not movie. Hot Rod Madness head to Atomic Blast for the best burnouts and hot rods in Mississippi. 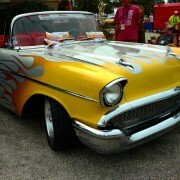 Burn those tires and meet the builders on these fun and very cool rides. This is a blast of a show with these cool cars smoking tires. If you love hot rods, you'll want to see this program. Tim the Milkman meets the best of best Hot Rods.